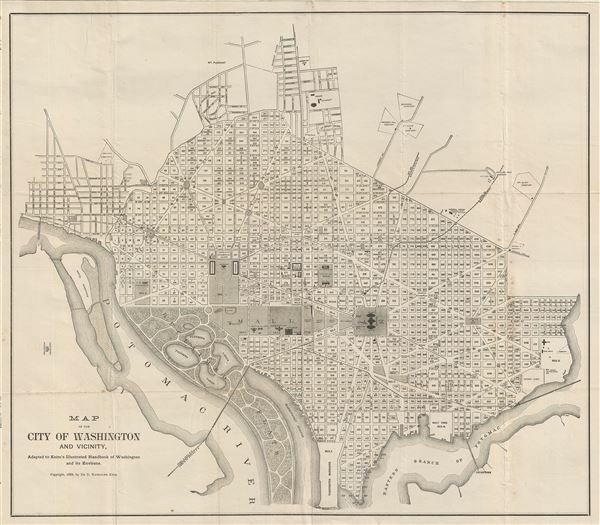 1888 Keim Map or Plan of Washington D.C.
Map of the City of Washington and Vicinity. This is a fine 1888 map or plan of Washington D.C. by De B. Randolph Keim. Centered on the National Mall, it covers from the Washington Barracks to Mt. Pleasant and from Arlington Cemetery to Congress Cemetery. The map offers a fascinating snapshot of the nation's capital at a time of rapid expansion and urban development. It shows the city in considerable detail with numerous important buildings including the Capitol, the Smithsonian Institution, the White House (not yet called the White House), the Washington Monument, the Navel Yard, the City Hall, and others noted. The city's famous grid and ray structure appear according to L'enfant's brilliant plan. Notes the reclaimed flats in the lower left – what is today the East Potomac Golf Course. The map is accompanied by a 72 sightseer's guide book 'copiously illustrated by a series of consecutively arranged route maps, diagrams and engravings, directing to, locating, representing and describing places, buildings, and objects of interest in the magnificent governing city of the nation.' This map is copyrighted to 1888 De B. Randolf Keim. Very good. Minor wear along original fold lines. Minor spotting. Accompanied by 72 page sightseer's guide book.